I’m sure everyone has at least one friend who has a really sweet tooth. It might even be ourselves, especially when it comes to delicious confectionery like chocolate. There are many chocoholics who walk amongst us; that’s for sure! We just can’t get enough of the sweet stuff, whether it be white, milk or dark. Studies have shown the endorphins it releases are similar to those that occur when you fall in love. So it’s no surprise the cocoa bean has been revered for thousands of years. Below are some tips how you can spoil you and/or the chocoholics in your life. Why not treat the birthday girl or boy to a chocolate party? It’s a brilliant way to learn some new skills and have lots of fun at the same time. And let’s not forget, you get to taste the lovely stuff too. You can have your party themed to the occasion, so whether it’s a birthday, a bachelorette party or just because you can – it’s up to you. If you don’t fancy getting busy in the kitchen, why not have a chocolate tasting party instead? There are companies that will come and set up a display, tell you about their bespoke lines, and give you the chance to sample them all. What’s not to love? 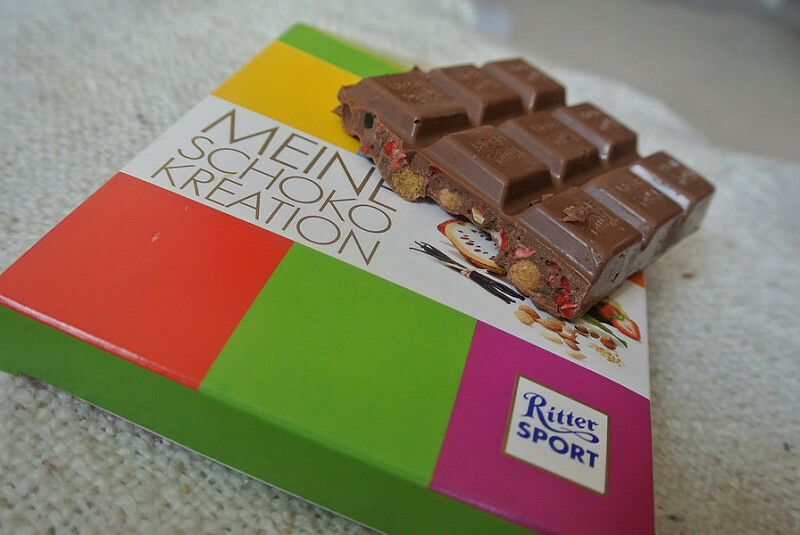 If you like to create your very own chocolate bar with some help from top chocolatiers, Rittersport Schokowelt in Berlin is the place to go. And it’s easy too: First choose whether you like white, milk or dark chocolate; then pick 3 delicious ingredients such as almonds, vanilla cookies, cranberries, cornflakes and fruit gummies (my personal favourite). Your creation will be made right in front of you and gets nicely wrapped up once done, so if you can resist eating the chocolate, this could even be a nice present. If you want to go for something a little more in depth, how about some classes in the Art of the Chocolatier? This is where your can learn how to make chocolate from scratch. That is, in theory, a brilliant idea, but if you could do it from home… well, it could be worrying for your waistline. These workshops will also teach you how to use moulds and create professional quality bespoke chocolate recipes. Feeling hungry yet? I am for sure! But the ultimate gift that any chocoholic will never forget would be a trip to Switzerland. Yes, it’s quite an extravagant present, but it sure beats a standard box of chocolates from the gas station; that’s without a shadow of a doubt. Switzerland is known for producing high quality chocolate and truffles. If that’s not enough to tantalize your taste buds, then you’re very hard to please indeed. The country is known for being one of the happiest countries in the world. Maybe that’s because of all the classy confectioners. Treat your loved one to a stay in one of the luxury hotels in Switzerland for another extra special gift. Did you know chocolate can only be called Swiss if it has been manufactured in the country itself? The ingredients may have come from further afield, but they have to be processed there to use the name. It’s not surprising they are keen to protect their heritage. When you make something as special as their chocolate, you don’t want anyone else being able to rip you off! What’s your favourite chocolate? Have you ever made your own? I’d love to hear your stories in the comments below! Thanks for sharing my kids are very fond of chocolates. Thanks, yeah it’s hard to resist 🙂 You should definitely check out the Rittersport Schokowelt in Berlin or another good one is the Chocolate Museum in Cologne when you travel to Germany!